Friends, I took previous spring boot hello world application and just added the SpringJava4sController class and written RESTful web service related logic. I haven’t added any new dependencies nor written any XML’s, rather added a simple java class. My REST class is annotated with @RestController, which tells Spring Boot to consider this class as REST controller and register @RequestMapping paths inside it to respond to the HTTP requests. Note: Have you clearly observed the above directory structure? I have created Spring Boot main application class in com.java4s.app and controller class in com.java4s.app.controller, and in my controller class I have written my RESTful service logic and was able to execute the application successfully. How spring boot knows to scan our controller? As we have created our main class in com.java4s.app package, while starting our application, it will scan all the components under that package. 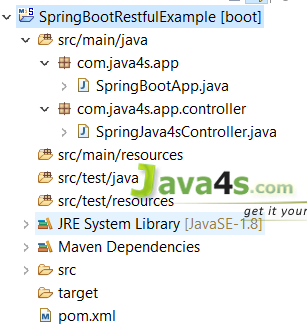 As we have created our controller class in com.java4s.app.controller which is inside com.java4s.app, our controller was registered by spring boot. What’s the solution for this? we have to add @ComponentScan annotation in our Spring Boot main class, something like this.. Your way of explanation is too good, i always refer this side to recall any toping which has been discuss in this turorial. I have request you to provide detail tutorial with more example on Spring Rest, Sprint Boot. And also please provide some Java 8 Concepts. Can u provide spring+rest services+hibernate CRUD operation. really java4s is very helpful sir,I learnt a lot from you. I'm new to spring boot. Yours way of explaining the concept its good. Thank you so much Sivateja. All technologies your explanation is awesome. Hiii sir your explanation is very excellent thank you for giving this wonderfull tutorials and i would like to request you please make youtube videos it's so helpfull for us…. Excellent explanation. Thanks for sharing knowledge. Very nice explanation.. your article is completely self explanatory… Thanks for sharing your knowledge.